This Airbus A320 got chased by a follow me car on the runway after landing far away from the centerline due to a crosswind gust. Of course the Apron police was nearby to pull the Airbus A320 over to give the crew a 10$ fine for reckless driving :D. What a fantastic timing of the runway inspection vehicle this day. We had crosswinds up to 8 knots that day (which is basicly nothing) and the Airbus A320 was the only aircraft which did &quot;something special&quot;. 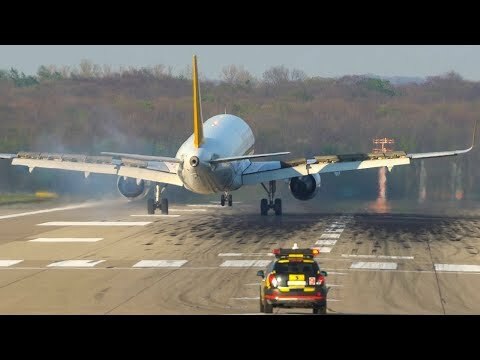 The Follow me car did its typical runway inspection right after the landing of the turkish Airbus. I filmed a few interesting Airbus planes last week. Check out the Condor Airbus A320 with the Air Transat tail. The aircraft just returned from its winter lease and due to the beginning of the holidays the aircraft operated four flight for Condor in this paint scheme. Right now the aircraft is getting its normal Condor c/s in spain.